ORLANDO, Fla., Nov. 30, 2018 /PRNewswire/ -- With billions of dollars in recent contract wins, Lockheed Martin (NYSE: LMT) is fueling thousands of high-tech jobs in Orlando, driving long-term economic impact to the community. The company presented a $300,000 check to Valencia College to support a second advanced manufacturing training program that will help cultivate the talent pipeline in the community. This will be a three-year long grant to the school starting in 2018. The first program hired about 60 people and currently employs about 400 Valencia College graduates in Orlando. 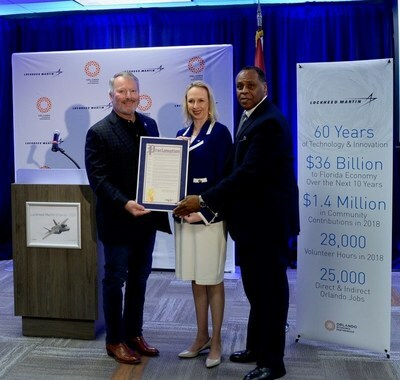 "After more than 60 years in our community, Lockheed Martin continues to develop some of the most advanced technology in the industry right here in Orlando, employing 8,000 of our residents and consistently contributing to our economy and our community," said Orlando Mayor Buddy Dyer. "We are grateful for Lockheed Martin's commitment to growing our talent pipeline through partnerships with both University of Central Florida and Valencia that will ensure we meet our future workforce needs while also cultivating our community's next generation of scientists, technologists and engineers to work in the high quality careers of tomorrow at a company like Lockheed Martin." On Nov. 27, the company announced a $1.5 million grant to the University of Central Florida (UCF) to establish a Cyber Innovation Lab. The lab will foster the next generation of cyber talent. Lockheed Martin employs more than 2,200 UCF graduates in Orlando. "Developing the latest technology to support our nation, fostering the next generation of talent and growing the economy are our top priorities," said Amy Gowder, general manager and vice president of Lockheed Martin's Training and Logistics Solutions line of business. "Continued growth and success of our Orlando business is made possible by the hard-working men and women who produce, develop and test critical technology and components that are vital to our national security." With February's announcement regarding expansion, the company anticipates continued career opportunities, including within the supply chain, that supports significant training, technology and production contracts. More information on many Orlando-based positions can be found on the company's careers site. "With major contract wins over the past several years, we've been able to add additional employment opportunities and economic stability to the area," said Michael Williamson, vice president, Lockheed Martin Missiles and Fire Control. "Orlando is a tremendous place for us to continue to grow and solidify our roots, offering viable, high-paying jobs for the incredible STEM talent we're seeing from local universities and beyond." "Lockheed Martin's presence in Orlando began more than 60 years ago with America's launch into the space race, establishing the region as a dominant player in developing advanced technologies that positively impact our nation," said Tim Giuliani, president and CEO, Orlando Economic Partnership. "We are thrilled for that legacy to continue as business growth extends educational partnerships, STEM programs, and the development of advanced technology in Central Florida." In addition to support for Orlando and Florida academic institutions, Lockheed Martin announced its award of 200 scholarships of $10,000 per student, and the awards are renewable each year. This national program is open to individuals studying engineering or computer science who demonstrate financial need and come from underrepresented or underserved communities. The program will grow to 1,000 students by 2023 and $10 million in scholarships annually. Lockheed Martin business in Orlando is at the forefront of the aerospace and defense industry in developing technologies related to electro-optics, sensing, mission systems, training and technology. Strong partnerships with educational institutions and STEM programs in the community ensure the next generation will advance these technologies to support our nation well into the future. For additional information, visit our website: www.lockheedmartin.com and here for specifics on the company's Orlando presence. The Orlando Economic Partnership (the Partnership) works to provide the Orlando region with quality jobs, economic growth, broad-based prosperity and a sustainable quality of life. It is a not-for-profit, public/private partnership representing seven counties – Brevard, Lake, Orange, Osceola, Polk, Seminole and Volusia – as well as the City of Orlando.